Not for next year though. When does Vettel's current contract at Ferrari end ? Rumoured to be Haas from what I've seen. 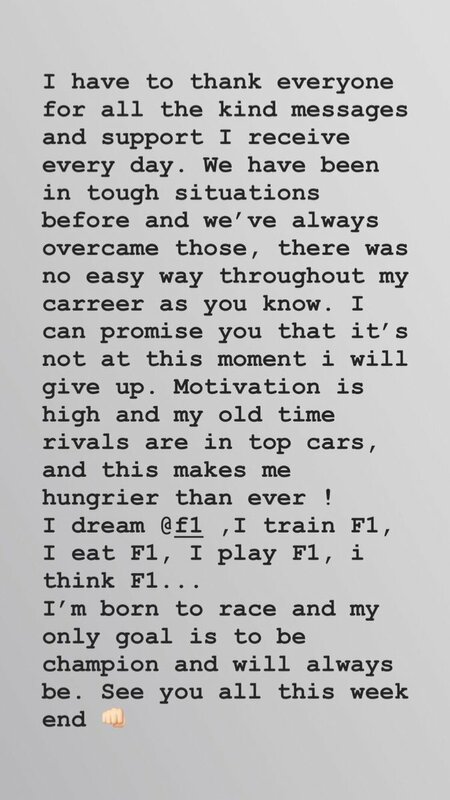 Doesn't sound like it upon reading Ocon's letter. Saward reckons he personally spoke to Gene Haas in Italy, and was told that as long as Grosjean keeps it out of the walls, he has no need to change either of his drivers. Perez could still be going to Haas but perhaps papa Stroll doesn't want his son to be teamed with a better young driver than he is? In this case both Ocon and Russell might be out of the running at Force India. Unfortunately apart from Stoff getting another shot, I think that'll be the missing pieces and Ocon will miss out which is just depressing. Not sure Williams can take both Sirotkin and Markelov without causing issues for the two different sets of Russian sponsors associated with both. Hopefully that's the case and it forces them to look at Ocon (or even Russell). I know it doesn't need saying again, but the fact that it might require such a situation to *force* Williams to take Ocon is just ridiculous. Red Bull promoted Verstappen from a junior team, Ferrari promoted Leclerc from a Ferrari based car but Mercedes hesitated to promote Ocon when then had the chance! I know Bottas was doing good & they weren't expecting FI to get in such a sticky situation but Mercedes losing a talented driver like Ocon is going to hurt them for a long time. Would be the dream. Lots of potential in that lineup. Unfortunately it seems very unlikely. The bottom line is that Mercedes' young driver program is suspect. There is no connection between the program and their actual F1 team. There is no path to a Merc seat that leads through their development program. Say what you want about Ferrari but they have pulled the trigger here. They have promoted a youngster that they supported through the ranks. Red Bull have written the book on this. For the last decade, every Red Bull driver has come through their development program; from Vettel to Ricciardo to Verstappen to Gasly. They've all been a part of the program, raced for Toro Rosso and then got promoted to Red Bull. Mercedes had the opportunity to promote Ocon but they instead hastily re-signed Bottas. In their defense, perhaps they aren't sold on Ocon. He is awfully tall at 185 cm and you can't help but wonder whether that will limit him relative to the very best drivers out there. He also hasn't really distinguished himself from Perez to a great degree. He basically compares to Perez much like Hulkenberg did; faster over one lap but perhaps not as strong in the races. I think that Mercedes are ultimately not particularly interested in developing talent. Toto made that clear when he said they weren't interested in having a B-team (a must if you want an effective young driver program). They're happy to pay top dollar for talent that has been developed elsewhere. Rather than worrying about grooming a successor to Hamilton, they have chosen to maintain peace and harmony within the team by keeping Bottas (a driver who is no slouch but who is clearly NOT Hamilton's successor) and just milking this purple patch of Hamilton's career for all its worth. When Lewis hangs up his helmet, they'll probably spend the money to bring in Max to replace him. Ocon would have been better off in the Red Bull program. Raikkonen winning a couple of races next season with Sauber. Could this be part of Silly Season 2019? Raikkonen hasn't won a single race in 5 years at Ferrari and you think he'll win 2 at Sauber next year? Gotta love Kimi fans! Sakon Yamamoto to Force India then? Ocon's tall but as long as he can get in the car it won't disadvantage him as he's so light. I think Ocon is already doing better against Perez than Hulk did and will probably improve. I think had they waited until it all panned out they may have put Ocon in he car over Bottas. Trouble is Bottas is also managed by Wolff so he's hardly going to leave him high and dry either. Sorry to nitpick but the BIB isn't true, and hasn't been true since Bottas became a Mercedes driver. Fair enough. I wasn't aware. That sounds over complicated, I'll go with what seems more likely judging by things that have been said that says Perez stays put. Ocon clearly doesn't think FI are an option. I think it's Williams or bust. Mercedes just have to give Williams a sweet engine deal for Ocon. Unless you find a gem of a young driver like Hamilton it will cost a team to place a younger driver elsewhere in this age of pay drivers and sponsorship. So who's in the second seat at Sauber? The Swedes own the team so will it still be Ericsson? Well, rumour is Giovanazzi has a contract somewhere. Saward is suggesting the not so mystery Swede backer is quietly looking for a way out but that he wouldn't want to bet either way on who gets the seat. From a selfish perspective, Ericsson would be a lovely marker to compare Raikonnen and Leclerc, but from a 'seeing talent come through' viewpoint, Giovanazzi far deserves the ride more than Ericsson. A basic problem with Ocon is that he's good but he doesn't look special, Perez is seen as a tier 2 driver but Ocon is not beating him, they look very evenly matched so he's a driver who is a like for like replacement for Bottas. It needs Bottas to under perform at Mercedes or they simply bite the bullet and commit to their young driver and sack a driver that's not given enough cause to be sacked, that's hard to do. I see the situation a bit differently with Ferrari, the performance gap between Vettel and Kimi has been that bit wider plus it's hard to pigeon hole Leclerc because Ericsson is less than an average F1 driver but I guess you judge against Wehrlein and Leclerc has been far more impressive so he's standing out rather than being matched by other drivers. Another season alongside Ericsson would have learned Ferrari not much more about Leclerc, they needed to put him in the Haas which I believed they tried to do but Haas were not interested so if you are going to put Leclerc in the Ferrari why wait the extra year which is not going to learn you much more about Leclerc? Still a bit of a gamble though but with Kimi going to Sauber that could be seen as a back up option in case things go wrong for Leclerc? Apparently Ferrari have choice of one driver, did Ferrari choose Kimi? You don't need to see that comparison because Leclerc against Vettel will tell you that anyway, from a Ferrari viewpoint Kimi and Giovinazzi at Sauber would tell them a lot about Giovinazzi. To be honest, I don't think Giovinazzi is anything special. He's not that young (he'll be 25 next year) and he hasn't won any feeder series of note. He's an also-ran at best and I honestly don't know why they would waste the seat on him. Almost won the F2 championship in his debut season. Until Leclerc that hadn't been done in years. He's also Italian. Last edited by mikeyg123 on Tue Sep 11, 2018 9:02 pm, edited 1 time in total. Almost one the F2 championship in his debut season. Until Leclerc that hadn't been done in years. He's also Italian. Yeah let's see him get his chance first, he was 22 when he finished 2nd in GP2 as a rookie, not his fault he's had to sit out for 2 years. "Almost" being the key term. Nowadays 22 is old for a first season in GP2/F2 and he didn't manage to win it. I've learned my lesson from Vandoorne. Don't get overly excited about older-than-normal drivers doing well in the feeder categories. You're mostly just seeing the additional experience making the difference. At least Vandoorne was winning those championships. It's unfortunate that Giovinazzi has been sidelines for two years but if he were truly amazing, that would not have happened. I see no way that he's an elite level talent. Giovinazzi has to be a more interesting choice than Ericsson. By definition you're never going to have 20 elite drivers in F1. Not everyone who makes their debut can be the next Alonso. An upgrade from Ericsson? Yes, I agree but right now there are numerous young drivers looking for a seat, many of whom are more interesting that Giovinazzi. Gio is he only one he might get the Sauber seat which is why we are talking about him. Really only Russell and whoever wins the GP3 championship that look brighter and have the super licence points anyway tbh. In terms of young rookies.